Monitor and measure product quality using the Quality module. The Quality module is based on an application modules tree. The application modules tree is a logical depiction of the product, reflecting the product's functional areas. It is typically defined by the business analyst. The application modules tree shows how the application is broken down and allows you to track quality by logical business areas. The Quality module includes tests, defects, and features, all of which can be associated with application modules to help you analyze quality by business areas, locate pain-points in your product, and concentrate your efforts in these areas. For details, see Assign items to application modules. When deciding how to structure your application models, focus on areas of the product for which you want to track quality, how you structure the application, and how users use the application. Before you can perform any analysis, build the application module tree. In the application modules pane, click the Add item + button. In the Add Application Module dialog box, enter the required information. If you select an item in the tree, it is used as the parent item. You can drag items to rearrange the tree. Repeat as necessary to create the full tree. Building the application module is typically a process that requires a number of iterations. Use drag and drop to restructure the tree. Drag application modules in the tree or drag items from the grid to the tree. Optional. 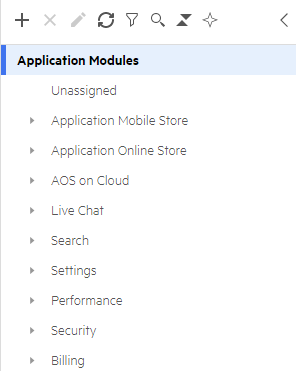 Select the application modules you want to display. In the application modules pane, click Define subset button, and make your selection. Optional. Add user defined fields to the application module. Customize the Details tab to include additional fields, including user defined fields. For details, see Customize fields. Use these fields to create cross-filters in the Backlog and Team Backlog modules and in the Dashboard. For details, see Cross-filters. Assign features, tests, and defects to application modules to help you assess product quality. To find unassigned items, click Unassigned in the application modules tree. Set the Application modules field in the item. Open the relevant items' tab in the Backlog or Quality module, and select the required items. In the toolbar, click the Assign to Application Modules button. In the dialog box, select the relevant application modules, and then click OK. If you are assigning automated tests, click Assignment Rule to create a rule that assigns automated tests. For details, see To create test assignment rules from the Tests tab. Use the Quality by Application Module widget in the dashboard to see an overview of all application modules and identify those that need attention. You can configure the On track and Needs attention thresholds. In the following example, the size of the application module in the widget is determined by the number of story points developed in the release and Needs attention is determined by critical open defects, low automation, or risky commits. The following is a typical example of test traceability of a manual test. The backlog owner creates a new feature and assigns it to an application module. A tester creates a manual acceptance test for the feature (or one of its user stories) in the Backlog module. The test automatically inherits the feature’s application module. Access the test from the feature to understand feature coverage, and from the application module to understand the area coverage.